It’s blueberry season around here. I look forward to this time every year. My husband and I really get into the competitive nature of picking, keeping rack of who has picked the most blueberries (it’s neck and neck). Unfortunately this year the blueberry farm closed after only one week this year due to a lack of blueberries. They are to open again next week, but we may not be able to get there. We still have blueberries in the freezer from last year, so I made blueberry jam with some of them. I’ve never made jam before and was really nervous. The recipe I had was very simple, that wasn’t the issue. It was the jarring/canning thing that made me nervous. I’d never done that before, but I quickly discovered it wasn’t anything to worry about. It was really easy and I can’t wait to try other flavors. 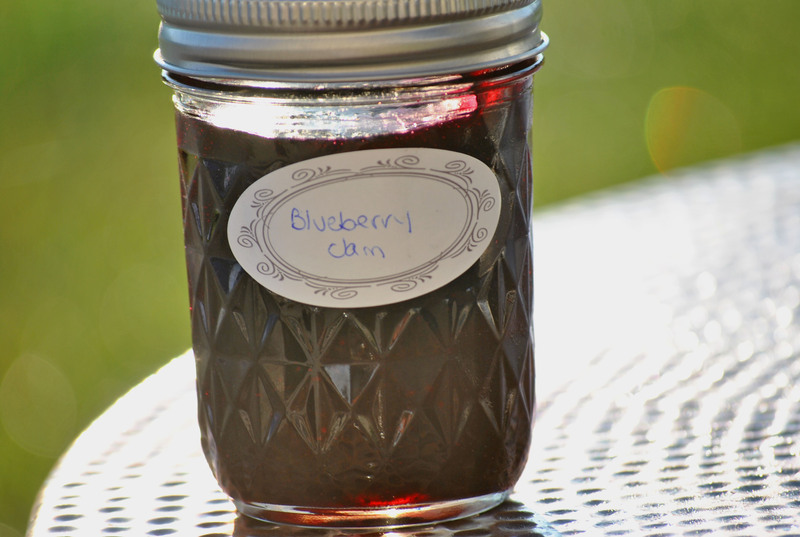 I’m also going to make the berry struesel bars with this jam and some of my blueberries-yum! Sterilize your glass jars, I used the dishwasher. 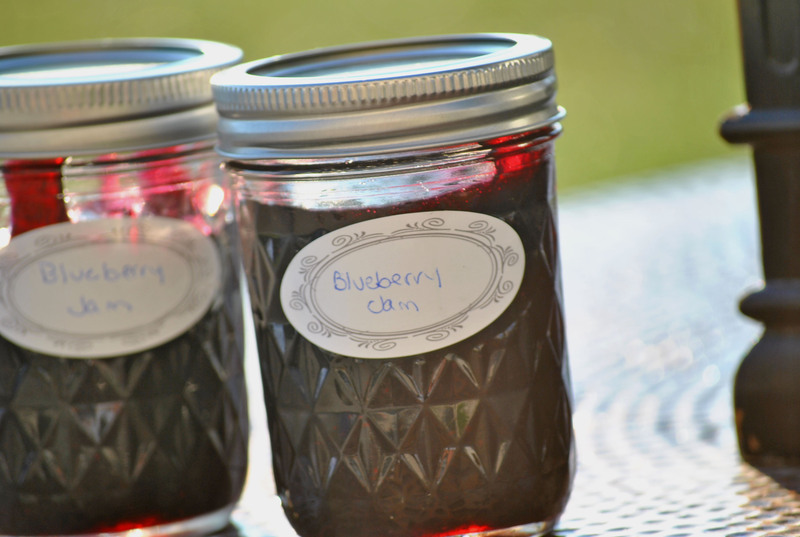 While you are preparing the jars, crush the blueberries in a large bowl, one cup at a time. I used a potato masher. Mix the crushed fruit and pectin in a large pot. Cook over high heat, stirring constantly, until the fruit has reached a full rolling boil. Add the sugar all at once and stir thoroughly. Bring the mixture to a full rolling boil again. Once it has reached the boiling point, cook for one minute and then remove from the heat. In another pot, add enough water to thoroughly submerge the jar lids. Bring the pot of water to a boil and add the lids. Ladle the berries into the prepared jars. With a damp cloth, clean the outside of the jars as well as the lip. This will ensure that the lid will seal. Add the lids, sealing tightly, and place the jars lid side down on a cookie sheet lined with a tea towel. Let then sit for 7 minutes and then turn them over, letting them rest for 24 hours. I had enough jam for 6 jars. I came across this awesome recipe for a root beer float cake that I knew would be great for Meeshie’s birthday. It’s a wonderful chocolate cake with a hint of root beer flavor. I must admit that I’m not much of a soda drinker (or do you say pop?). When I was a girl I never had soda very often. It was milk or Wyler’s, but on the occasion that I did have soda, it was either root beer or lemon lime. Then as I got older, I drank more soda but never really expanded my palate from those two flavors. Three years ago I stopped drinking soda all together and haven’t really missed it. That doesn’t mean I don’t like a good root beer float or root beer candy. That’s what this cake reminds me of, a piece of root beer candy. The cake is moist and has a hint of root beer, thanks to the root beer syrup. 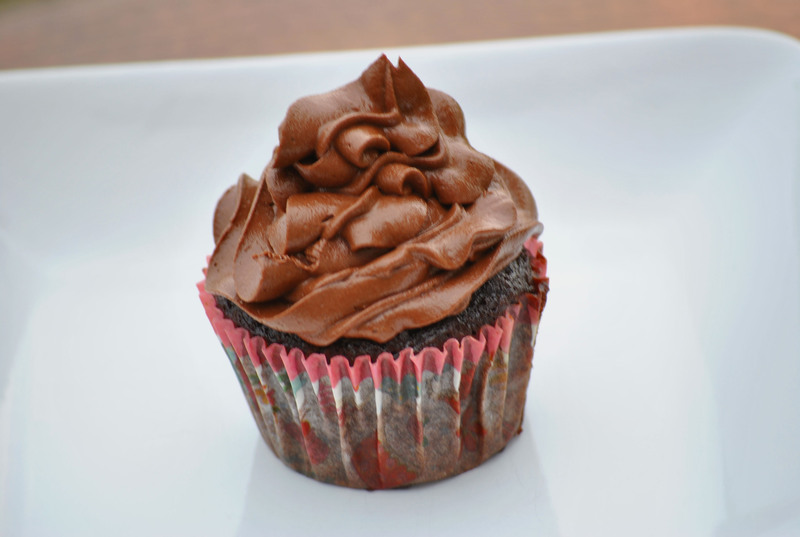 The frosting is heavier on the chocolate flavoring due to the cocoa, but you could easily add more root beer to give it more flavor. What I really loved about the frosting was how easy it is to pipe. Preheat even to 325 degrees F. Prepare cupcake pans. In a small saucepan, heat the root beer, cocoa powder and butter over medium heat until butter is melted. Add sugars and whisk until dissolved. Remove from heat and let cool. In a large bowl, whisk together the flour, baking soda and salt. In a small bowl whisk the eggs until just beaten. Then whisk into the cocoa mixture until combined. Gently fold the flour mixture into the cocoa mixture. The batter will be slightly lumpy. You can give it a quick whisk if you like, but don’t over beat the batter or it could cause the cake to be tough. Don’t worry, the batter is very loose. Pour the batter into prepared pan and cook for 20 minutes, rotating the pan halfway through baking until a sharp knife inserted in the center comes out clean. Transfer to a wire rack to cool completely. 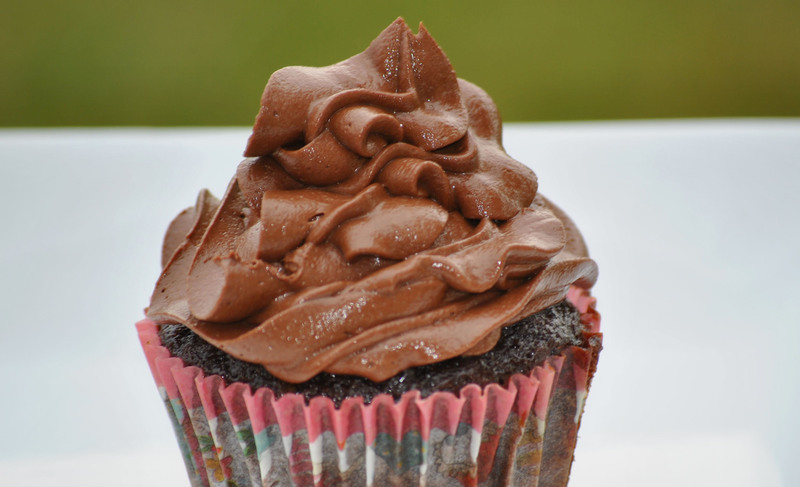 In the bowl of a stand mixer, or using an electric hand mixer, beat softened butter and cocoa powder. Once combined add the melted chocolate, salt, powdered sugar and root beer. Beat together until smooth. Spread on top of cooled cupcakes. 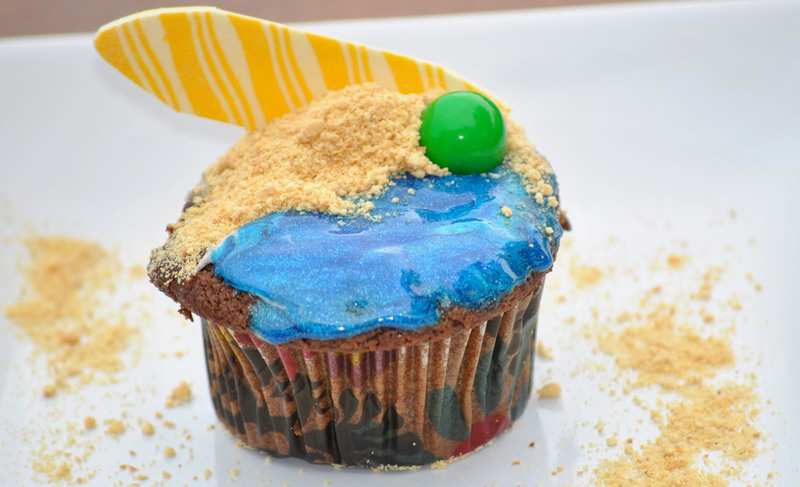 I made some of the cupakes this way and others with the beach theme. Yum! This year Meeshie wanted beach themed party, but since it was too close to the Hawaiian theme two years ago, I decided to do something radical. Radical for me, at least, because we had a “no theme” theme. I love to plan a party. It’s what I do. It’s what I’m good at. We’ve had a Hawaiian theme which included Hawaiian postcard invites and a volcano cake. We’ve had a karaoke birthday which included a concert ticket invite and piano cake. We’ve had a princess theme which included princess flip-flops. So this year it was pizza, some snacks and a beach cupcake. The cupcakes can be whatever you like. I’ll share a recipe later this week, but for now just enjoy this kitschy little thing. 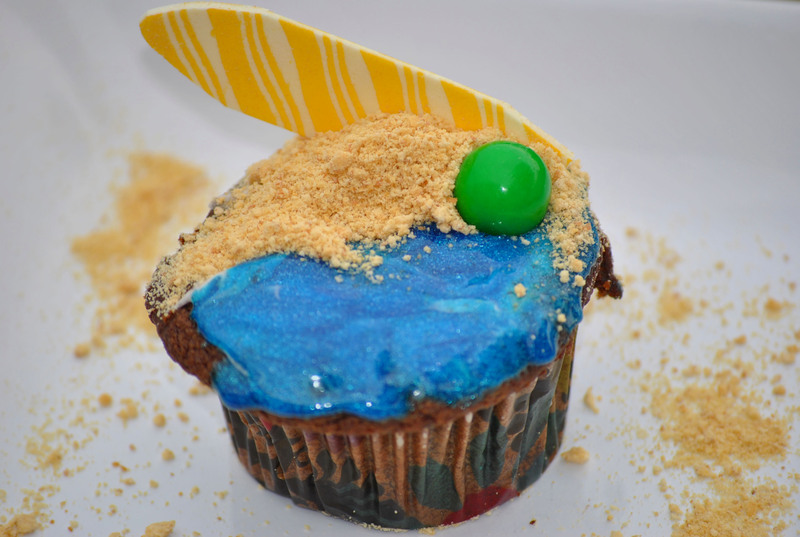 The surf boards are fruit striped gum, the beach ball is a gum ball, and the sand is graham cracker crumbs. I actually carved out the center of the cupcake and put some of the frosting inside, as well as put a small amount of frosting on the cupcake so that the gel and graham crackers would stick. My little girl is now 9. She’s worried about starting a new school this year. She’s worried about having friends. She’s worried about 4th grade. I wish she was more worried about mastering how to ride a bike, or keeping her room clean. I’ve heard my mom refer to Meeshie as my miracle baby. Unless you think that struggling to have a baby is a miracle, than she is. I don’t. While we struggled for years to have a baby, I discovered that we weren’t alone. Not by a long shot. There are tons of people who struggle everyday to have children and some are never as fortunate as we are. We struggled for three years to get pregnant and then on the day that we moved into our new home, we found out that we were finally going to get our wish. And when we struggled for another three years after she was born to add to our family, we finally decided that we would just be happy with our one and only. I have friends that are blessed with a child with special needs. I have friends that were fortunate enough to enjoy their baby for almost a year before God called her home. Those are miracle babies. Since our trip to Memphis last summer, my husband has been obsessed with barbecue. He has made sauce and tried smoking ribs. When we were first married, he had a smoker. He even smoked a turkey in it one Thanksgiving, but he soon got rid of it. It was too much work and it took forever to smoke the bird. Now, everywhere we go he looks at smokers, forgetting the work and the time he put into something that no one was impressed with. I suppose that if he had a better experience with that turkey we would still have that smoker, but that didn’t happen. My husband has since been able to recreate as much as he can the taste of the best barbecue he ever had last summer. I say that because every meal we had in Memphis was awesome. My husband is a lover of ribs and Memphis has great ribs. Not tourist ribs, good local ribs. A few times we asked either a policeman or bartender where to have the best ribs. Those are the people who know where the good food is. I look at it this way, when people from out of town come to visit, I don’t take them to Uno’s for pizza unless they ask. In my husband’s quest for barbecue, he’s also been experimenting with sauce. I think he’s nailed it with this one. He was looking for one that doesn’t use ketchup and between the two of us, we found it. 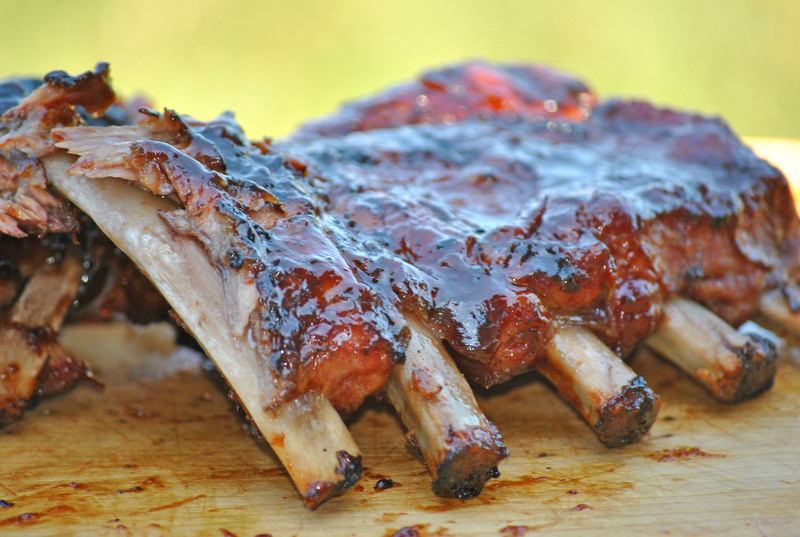 This sauce is perfect for ribs. We’ve been using a slightly different method to cook ribs that gives it more of a smoked flavor. These ribs are so tender, you don’t even need to cut them with a knife. Combine all ingredients into a medium-sized pan and bring to a boil. Simmer for 2 hours or until thick. Apply to chicken, ribs or pork chops. Refrigerate leftovers in an airtight glass container. Preheat the grill. 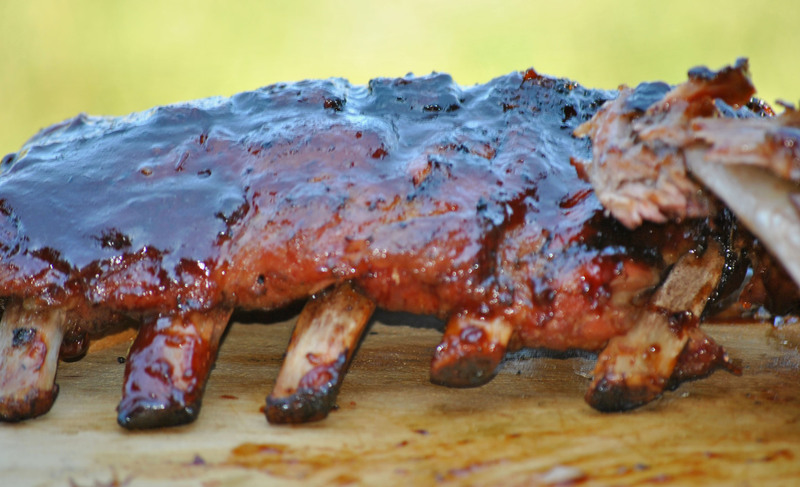 Grill both sides of the ribs to achieve the desired grill color , about 6-7 minutes per side. Remove the ribs from the grill and wrap in foil. 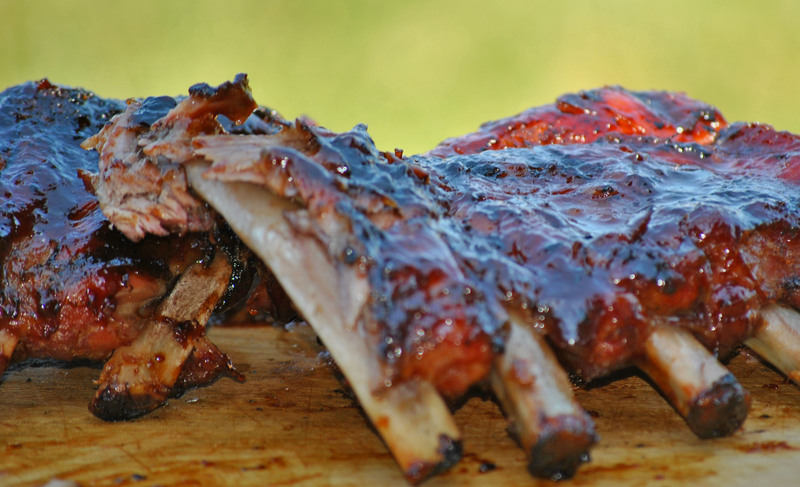 Turn off a portion of the burners and place the ribs on the coolest side of the grill. Continue cooking for an additional 1 1/2 to 2 hours (we check at the 1 1/2 hour mark), keeping the grill temperature between 335 to 350 degrees. Remove the ribs from the foil, add barbecue sauce and grill for an additional 3-5 minutes per side, until the sauce starts to caramelize. Serve the ribs with your favorite sides. I’ve been baking these last two weekends. Meeshie’s birthday part is next Saturday and I’ve made cupcakes and stuck them in the freezer. I’m planning on sharing soon. But even though I had to bake a batch of cupcakes twice (I made two flavors, and one of the flavors didn’t turn out right), I’m still baking today. I found a recipe a few weeks ago for streusel bars with fresh strawberries. I never seem to have fresh strawberries in the house long enough to bake with them. But I do have dried strawberries. I love the flavor of dried strawberries. I also have dried cherries. The flavor of dried strawberries and cherries together is wonderful. This recipe really lends itself to your favorite fruit, fresh or dried. Blueberries with blueberry jam? How about raspberries with strawberry jam? Dried apricot with peach jam? Or how about mixing a few of your favorites together, like I did? If you want to add a small amount of pecans. In a large bowl whisk together oats, flour, both sugars, baking soda, baking powder and salt. Add in cold butter that has been cut into small pieces. Combine into dry ingredients either with your hands or a pastry cutter until butter is well incorporated as little crumbles. Remove 1 cup of mixture and with remaining mixture carefully pour into a prepared 15×10 jelly roll pan/cookie sheet. Press mixture into pan to create an even crust. Place in oven and bake for 12-13 minutes or until it is firm to the touch. You do NOT want to brown this layer. Remove from oven. Warm jam in microwave for 30 seconds. Add in lemon zest and then pour over warm crust. Spread berries over jam layer and then sprinkle with reserved 1 cup crumb mixture.Pop into the oven and bake for 20-25 minutes until topping is a light brown. Remove from oven and let cool 1 hour before drizzling with melted white chocolate. Cut into 24 bars. I thought that I had some white chocolate in the pantry, but I used it all for my niece’s party. I melted some Hershey kisses and drizzled them on top. That being said I’m a huge fan of white chocolate and normally have it on hand. 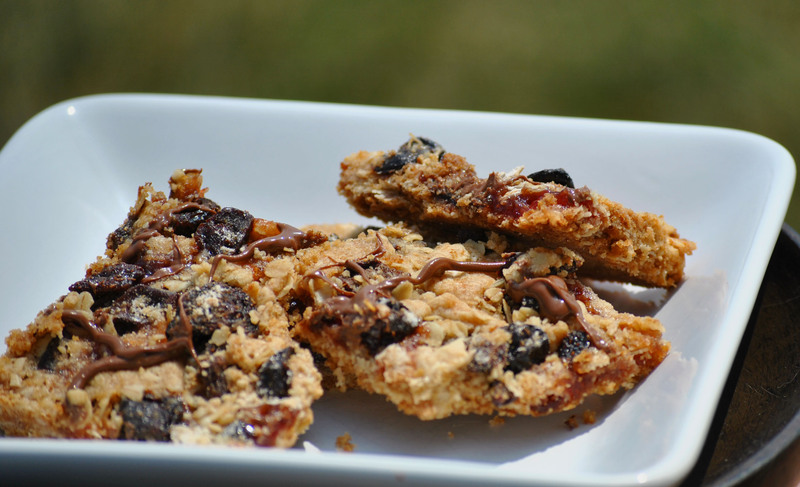 My husband loves oatmeal cookies and bars. So, when I came across this recipe I knew I had to make it. 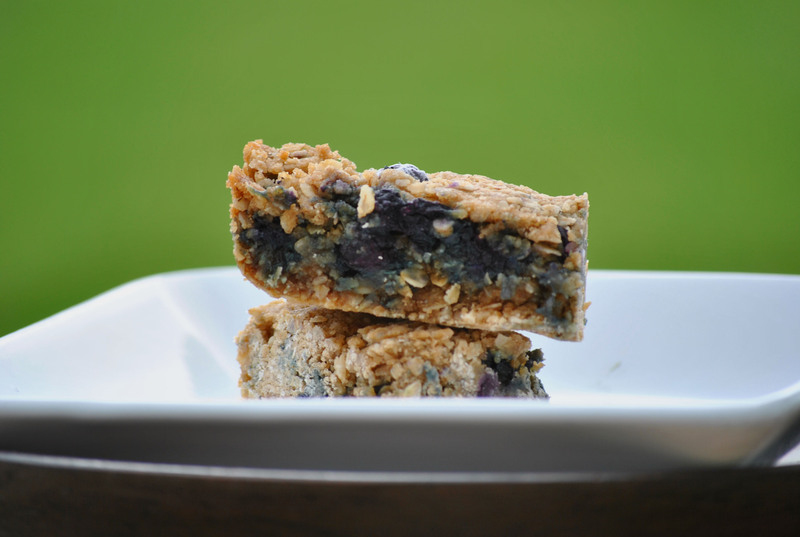 I don’t know about you, but I love a good oatmeal bar, but sometimes I get in a rut. 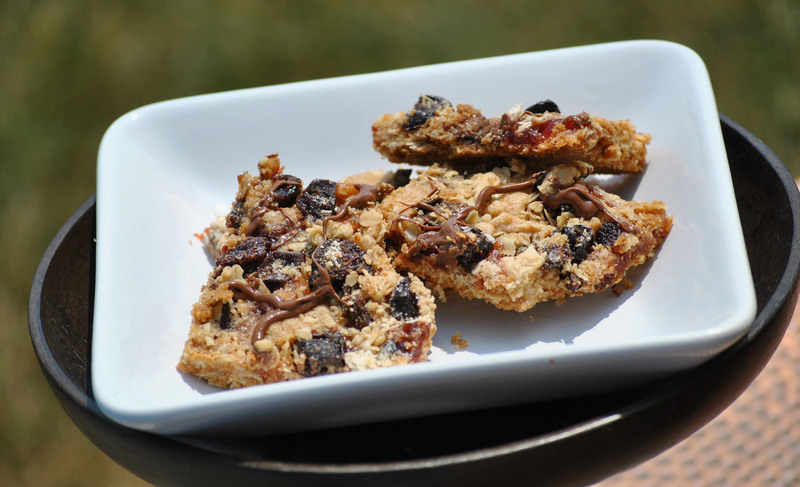 It seems like I always add raisins to oatmeal recipes, or butterscotch morsels. But blueberries and oatmeal? Now, don’t get me wrong. I love raisins. Raisins are awesome. They pair up great with oatmeal but sometimes I just want to have something a little different. That’s where these babies come in. The blueberries with the oatmeal really compliment each other. My husband and I actually eat these for breakfast when we need something quick. I used my blueberries that I picked and had frozen, because when you go to the blueberry farm and pick 15 pounds of blueberries, you have to freeze them. I like this recipe so much that I’m planning on making my oatmeal cookie pancakes with blueberries next time around. I was a bit sceptical about mixing the blueberries into the batter. I thought about putting some of the batter in the pan, spreading the blueberries and finally covering them with the more batter. But I’m glad I didn’t. 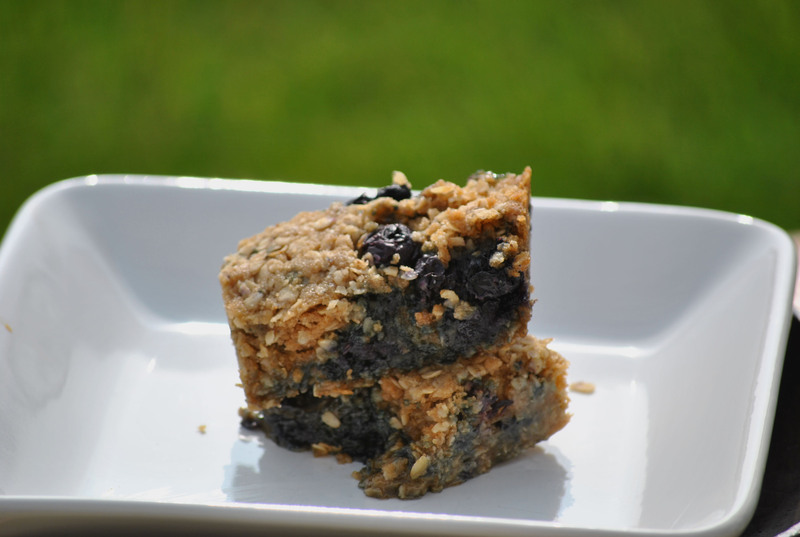 The blueberry is hearty enough to handle the gentle fold. Sift flour, baking soda, salt and cinnamon into a large bowl. Set aside. Cream butter and sugars until smooth. Add the egg, honey, and vanilla, beat until incorporated. Add the dry ingredients, including the oats, and mix well. Scrape down the sides of the bowl and gently fold in the blueberries using a rubber spatula. Add the batter to a prepared 8 x 8 baking dish. Bake for 20 minutes to 30 minutes. It will be done when the middle springs back after you touch it. We are big fans of bacon. We love it as it is. We love it as a side. We love it baked into things. As a result, we always have bacon grease on hand. I know that sounds strange, but really it isn’t. I keep the grease in the fridge and use it to fry things in. I fry green beans in the grease. Or how about some pierogi? Why not some haluski,? I’m sure I’m not the only one that cooks my hash browns in the grease. I know I use the bacon grease for more than that, but right now I’m at a loss. The flavor from the grease makes everything better. I came across a great recipe last week that reminded me of spinach salad when I was a girl. My mother made it a few times and you add the bacon grease to it to wilt the spinach. Someone at work was talking about how they always had wilted salad when they were young. I knew that I had to make it. It seemed that since the recipe looked so good, I had the ingredients and someone I knew talked about it, it needed to be made. I made this wonderful salad to accompany some awesome grilled italian sausage. My chive is starting to really come in nicely so I also added some that. I love fresh chives. I’m not using any amounts with this recipe, but I can tell you that I made enough for my husband to have two helpings. I used the end of one head of romaine and a small portion of a new one. 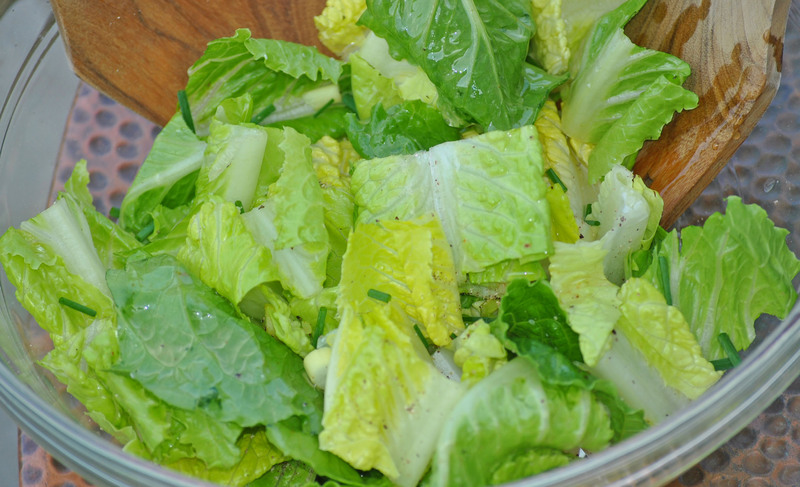 Make sure the lettuce is dry, and add the lettuce, onion, chive, salt and pepper to a large bowl. Heat the bacon grease and pour over the lettuce. You just want enough grease to coat the lettuce. You really don’t want the lettuce to be swimming in the grease. Toss and serve. 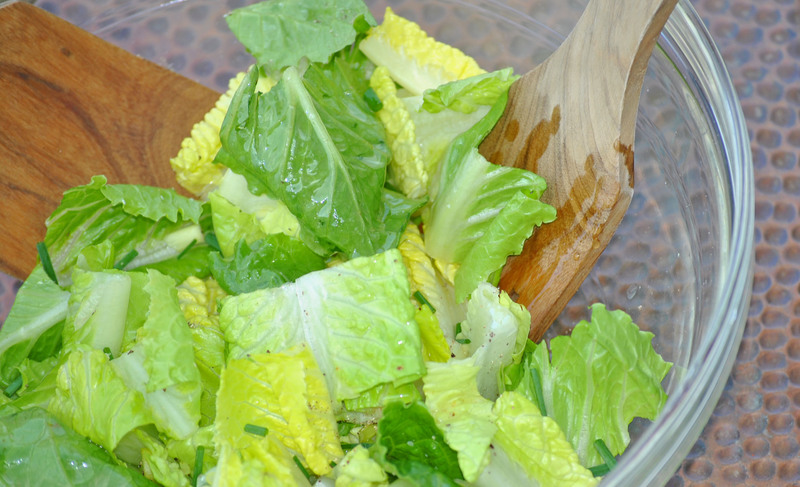 This salad is so simple and easy. The flavor of the salt and the grease pair well with the lettuce. Meeshie really loved this salad. Thanks Sheila for showing me this one and reminding me why I love summer cooking! You are currently browsing the Meeshiesmom's Blog blog archives for July, 2011.